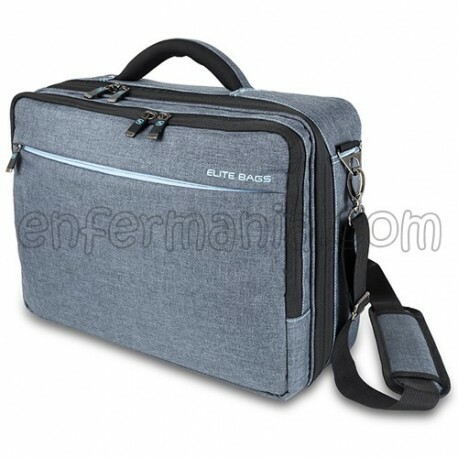 Briefcase multi-functional with modern design. Its extreme lightness and strength make him the perfect ally for the work of the day-to-day. Manufactured in material water repellent duotones, easy to clean, brings together design and versatility, allowing you to accommodate both the material work and personal items. Ergonomic handle and structure gooseneck that adjusts to the content. Shoulder bag for transport. 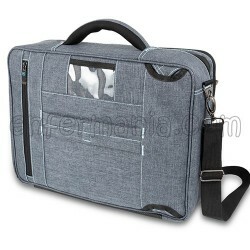 Main body with 3 compartments, removable front transparent for instrumentation and material. 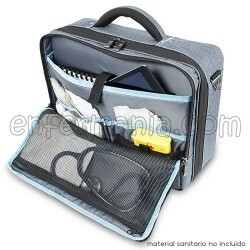 Ampulario isothermal padded with capacity of up to 38 ampoules. The compartments are velcro, allow you to adapt the interior to the needs of the user, include dividers, and adaptable carrying handle for easy removal of the same. Panel with elastic bands of different sizes for material cures. Inside pocket plane for dressings of large size. Zips with closure for padlock on the main compartment. Band to an external structure of the trolley and card holder on the rear panel. 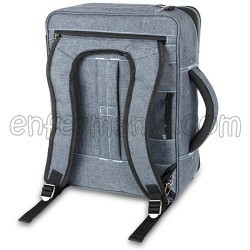 Shoulder straps of backpack hidden in the back of the case.